Or as low as $91.67 per month over 12 months. Apply Now. 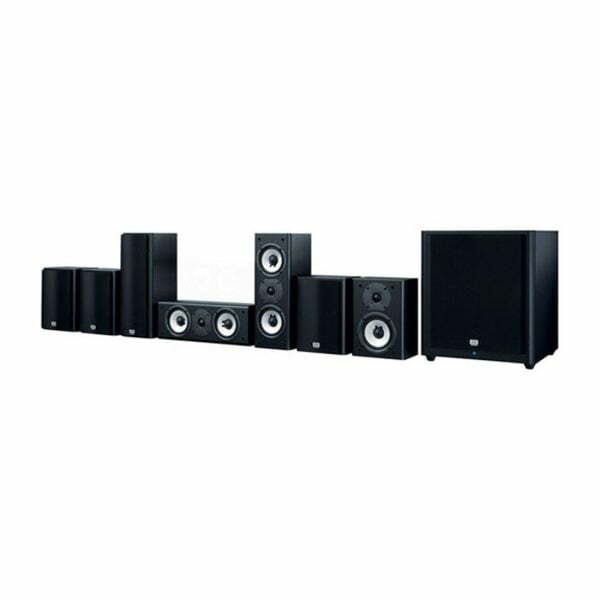 Onkyo SKS-HT993THX 7.1-Channel Home Theater Speaker System. Its THX certification ensures that you will hear your THX movie soundtracks as the director intended. The 125W subwoofer features a 12″ front-firing driver and the rest of the speakers sport a 2-way acoustic-suspension design to reduce bass distortion. Each speaker is independently tested by Onkyo and THX technicians to ensure film soundtracks demonstrate rich layers of detail and immersive wide-spectrum dynamics. This system’s solid MDF cabinets are designed to keep vibration minimal. Its A-OMF woofer diaphragms use layers of lightweight polyethylene naphthalate, cotton weave, and aramid to achieve enhanced speed and accuracy for augmented audio quality. Because the speakers are sealed, you can position them almost anywhere. It’s even possible to wall-mount the surround speakers without compromising bass power or clarity. Rounding out this 7.1-channel speaker package is a 125W powered subwoofer. Its 12″ front-firing cone is designed to fill rooms with wall-shaking bass.